A 60’ (18.4m) super yacht is picked up from the Rhine River to be transferred to the boot Düsseldorf exhibit hall. One way to look at these January shows is that they’re good opportunities to knock off some New Year’s resolutions early. It does seem like we’re more likely to start new habits or try to break bad ones right after the New Year. Maybe that’s why the American Boat & Yacht Council decided to hold its first Marine Law Symposium just 10 days into 2017? According to ABYC, the event will “prepare you to navigate the legal aspects of recreational boating accidents.” Another bonus is that it offers advice on how to be an expert witness—which is useful if your 2017 goal is to make more money (though you may lose some friends). The symposium takes place during ABYC’s annual standards week. See the full program here. This year’s boat show includes the German Superyacht Conference on Jan. 25 with a keynote address by Gorden Wagener, vice president of design for Daimler AG. According to show organizers, he’s considered one of the most important automotive designers in the world, and he recently developed the Mercedes brand superyacht Arrow 460-Granturismo. The boot Düsseldorf exhibit halls will contain 60 superyachts and more than 360 sailboats. 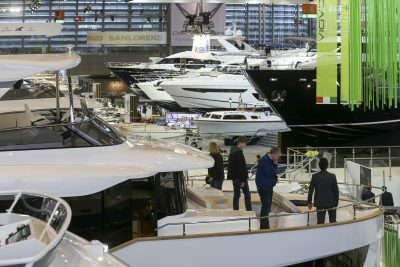 The 60-plus superyachts will make for an impressive sight, but this show also promises to be a big one for sailboats, with more than 360 exhibitors of various makes and sizes. Professional BoatBuilder technical editor Steve D’Antonio will be in attendance, though he’s likely to be wandering Hall 10, home of most of the marine-power suppliers and related products. If Steve sees anything he likes, he’ll let us know in a spring issue of the magazine. Visit the boot Düsseldorf website. Andre Cocquyt, with more than 40 years of composite boatbuilding experience, will not just talk about resin-infused hull repairs, he’ll also be demonstrating those techniques with a vacuum pump on the show floor. Steve D’Antonio will be back from Europe to present three seminars. He’ll cover repowering, conducting a pre-refit vessel inspection, and effectively dealing with and diffusing your most challenging clients. The Refit Show will include seminars by some well-known marine industry experts. James Coté, owner of Coté Marine LLC, and an ABYC Master Technician, will present two seminars: The first will be on corrosion diagnostics, repair, and prevention, and the second will be on better understanding the incompatibilities and conversions between European and U.S. systems. 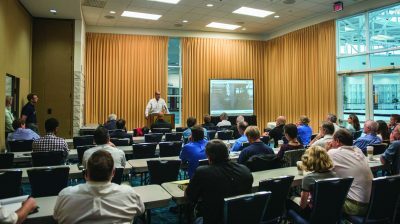 View the rest of the seminars and a list of exhibitors on the Refit website. Note that the Refit Show is produced by Professional BoatBuilder magazine. If you go, please stop by our booth, No. 106, say hello, and let us know what you think.